The rustic cart can stay on the terrace in the summer, and in the winter it can be placed indoors. This set is available for the F800B Campagnard brick oven . 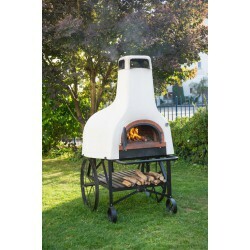 The all-in-one oven includes : Campagnard brick oven, cart, hood, hat 0.50 cm steel insulated flue, complete insulation, one cast iron door, one refractory insulating door, one 155 mm diameter flue connectors without any damper, vault thermometer and a tiller (to move the whole set). Drawing with dimensions is available under"download"